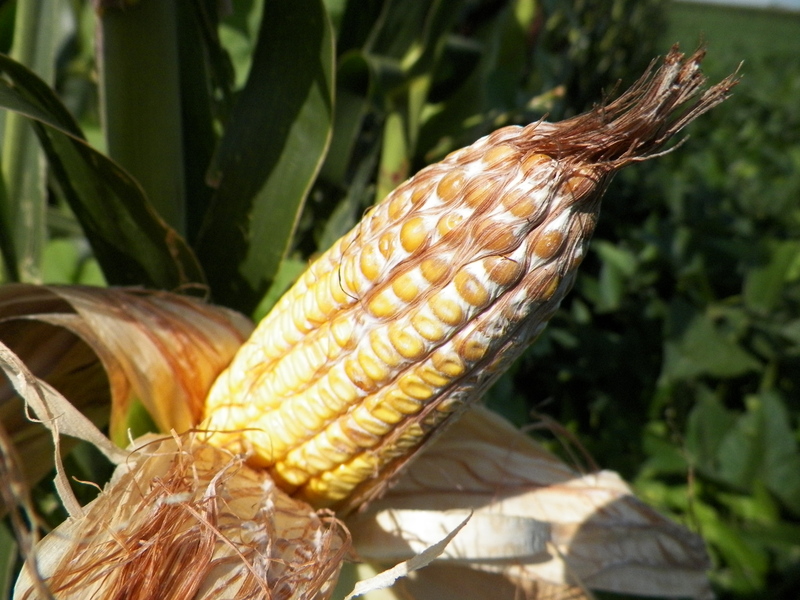 Symptoms and signs of Diplodia ear mold. In the past couple of weeks, symptoms of ear mold have popped up at the Northwestern Illinois Ag R&D Center. While most fields have rows upon rows of healthy-looking husk leaves enveloping plump ears, in some fields individual ears stand out as the husk leaves are a bleached or tan color (Figure). Upon peeling back these dead or dying husk leaves, one notices that many silks adhere to the ear, seemingly stuck there by white fungal growth (Figure). The kernels themselves may become dull-grey or brown in color and shrunken and light-weight. Over time one can start to see small, black specks appear on husk leaves, on or between kernels or on the cob itself (Figure). These specks are asexual reproductive structures of the fungus (pycnidia) that are visible to the naked eye. Spores produced inside these structures serve as the inoculum that may infect future corn crops. Conditions that favor disease. 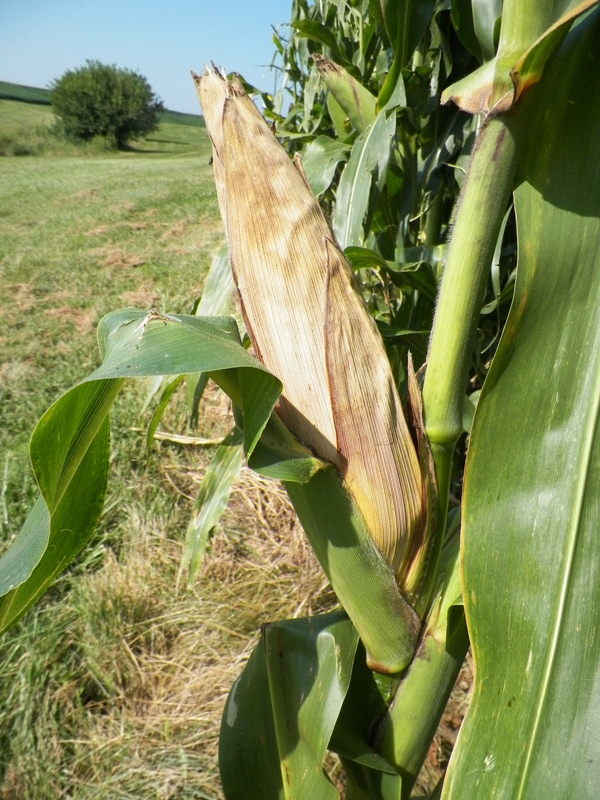 Corn ears are thought to be most susceptible to infection by Stenocarpella maydis, the fungus that causes Diplodia ear mold, in the 3 weeks after silking (milk stage), when the silks begin to die. Fungal spores are rain-splash disseminated onto the crop from residue from previously infected crops. At the research center this year, corn planted between April 5 and 15 reached the silking growth stage at the beginning of July after which time periodic rains brought more than 7 inches of rain by July 22 - perfect conditions and timing for Diplodia ear mold (WARM). Infections that take place earlier-on can result in the whole ear becoming diseased. Later infections may result in only portions of the ear being infected, often towards the base of the ear, with no outward symptoms or signs. Management considerations this year. Be aware of the potential for Diplodia ear mold this year and adjust harvest and marketing plans accordingly. Diseased kernels may be more brittle than healthy kernels, increasing the possibility of breakage and the amount of fine materials. Adjusting combine settings can help to maximize grain cleaning and minimize breakage. Additional cleaning of harvested grain is recommended before sale or storage to minimize discounts and to improve aeration in short-term storage. Drying and cooling the grain as soon as possible is recommended to stop the growth of both S. maydis and other fungi. Storing diseased grain separately and for only short periods of time is recommended to reduce the chance of additional losses. One positive: unlike some of the other ear molds, in the U.S. Diplodia ear mold is not associated with mycotoxin contamination. Management considerations in future years. Recently researchers at Purdue University investigated foliar fungicides for Diplodia ear mold management. They found that fungicides did not consistently improve yields even under conditions that favored disease development. As is evident at the research center this year, hybrids vary considerably in their genetic susceptibility to Diplodia ear mold. Select hybrids with high levels of genetic resistance to plant in fields that have had a history of the disease. 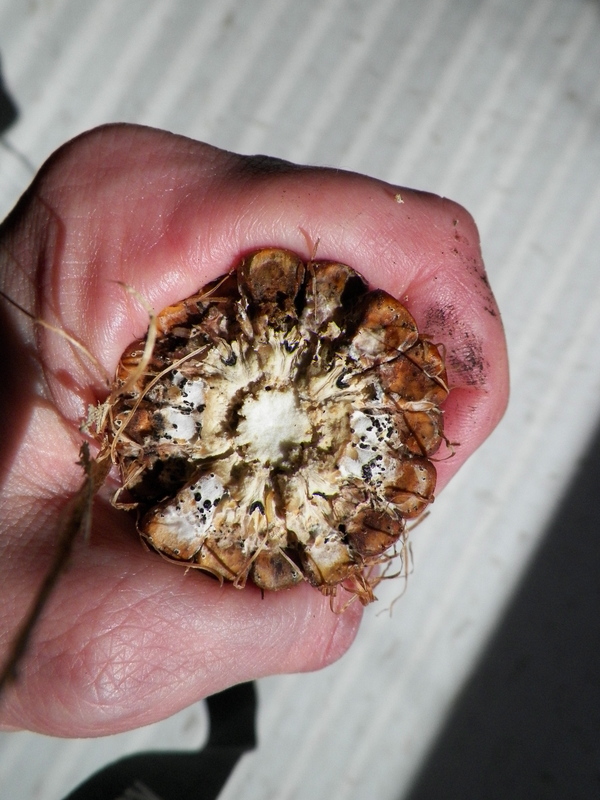 S. maydis has a host range of one - corn – and survives in infested residue on the soil surface. This is why both crop rotation and tillage are important management strategies to consider. Munkvold, G.P. and White, D.G. eds. 2016. Compendium of Corn Diseases. 4th ed. APS Press. St. Paul, MN.